In October, 1955 the Suzuki Four Wheel Car was released as Suzulight SS (2-door sedan), Suzulight SD (2-door wagon), Suzulight SL (3-door sedan) and Suzulight SP (pick-up). It was inspired by the Lloyd LP 400. The wheelbase was 200 cm, the length 299 cm, the engine a 359 cc air-cooled 2-cycle (from the motor cycle industry) driving the front wheels. The suspension was independent coil front and rear, changed to transverse leaf in June 1956. By May 1957 Suzuki concentrated on mass production of the SL model only which was regarded a commercial type of vehicle. This vehicle was renamed Suzulight SF in January, 1958 with the engine enlarged to 360 cc. Then, in October, 1959 the Suzulight Van (TL) 2-door wagon was introduced with the same engine (21 instead of 16 HP), placed transversely, and driving the front wheels. The wheelbase was now 205 cm. The suspension was independent front and rear with a transverse leaf spring. With a length of 299.5 cm came in April, 1962 the Suzulight Fronte 2-door sedan. From May, 1963 there was a new engine with a different bore and stroke staying 359 cc (FE). By October, 1965 the wagon received larger wheel openings at the rear. May, 1967 saw the introduction of the Suzuki Fronte 360 2-door sedan with the engine at the rear. The wheelbase was down to 196 cm, the suspension independent with coil springs and the engine a 356 cc 3-cylinder air-cooled 2-cycle, placed transversely. 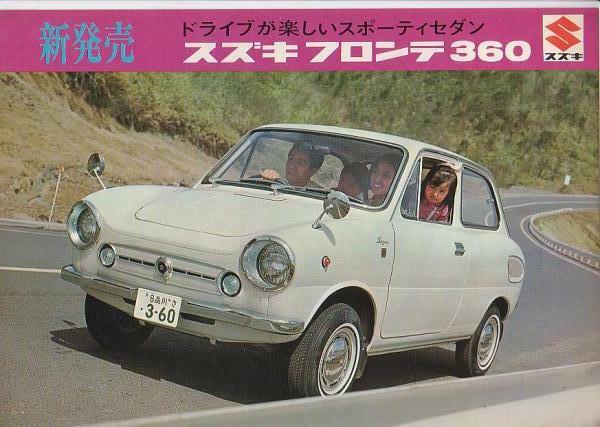 Its overall shape had a roundish profile, nicknamed 'Daruma', a Japanese roly-poly doll, and this is the smallest (and only Kei) car which used the cola-bottle shape, that became popular in the USA for the 1965 model year. In November, 1968 came the Suzuki Fronte SS 360 with 36 HP, with the Suzuki Fronte SSS to follow in April, 1970. In the export there was also a Suzuki Fronte 500 with the engine enlarged to 475 cc since January, 1969. Also in March, 1969 as a successor to the Suzulight Van arrived the Suzuki Fronte Van 2-door wagon with a conventional drivetrain lay-out (engine in front, rear wheel drive), with a rear rigid axle with leaf springs and a wheelbase of 199.5 cm. The engine was the air-cooled 3-cylinder 2-cycle 356 cc. By July, 1969 a less commercial version arrived as Suzuki Fronte Estate possibly to give the car buyer a model with more luggage room without having to buy a commercial version. In June, 1970 this model was succeeded by the Suzuki Fronte Custom with the same wagon body style but without a rear hatch, there was a bottom-hinged trunk lid only, possibly to please the customer (who found too few luggage room in the rear-engined Fronte) in disguising the fact that actually a wagon (not popular in those days) was involved. This model was deleted in 1971 (after the addition of a more luxury version, called the Fronte Hi-Custom in August, 1970). Also in June, 1970 became available a wagon with a 2-piece tailgate, next to the top-hinged one-piece version. By the 1973 model year the engine in the Suzuki Fronte Van became a 2-cylinder 2-cycle water-cooled 359 cc. In April, 1970 arrived the Suzuki Jimny 4WD vehicle. This car was developed from the Hopestar ON. The body was open with canvas doors and there were 3 seats. The wheelbase was 193 cm, the suspension a rigid axle with leaf springs front and rear on a separate chassis. The engine was initially the 2-cycle 2-cylinder air-cooled 359 cc, which became water-cooled in May, 1972. At that time a 3-seat 2-door wagon was added. In February, 1975 an open body became available with 2 opposite seats at the rear. 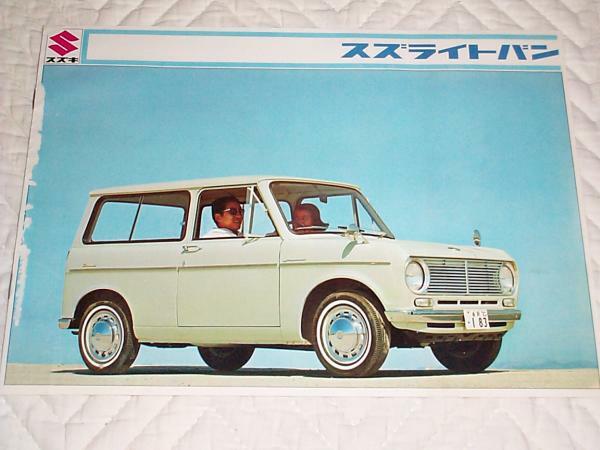 By May, 1976 complying with the revised standards for the kei car vehicles, the engine became the 3-cylinder 539 cc (in the export since 1974), and the length grew to 317 cm by putting the spare wheel at the back of the car instead of inside. 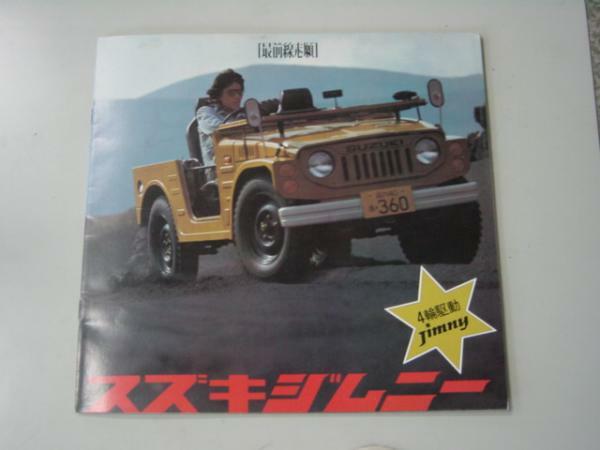 The car was named Suzuki Jimny 55. By extending the wheel arches, the width of the car grew to 139.5 cm in June, 1977. In October, 1977 the Suzuki Jimny 8 was added with a 4-cylinder OHC engine of 797 cc. In October, 1978 an open body with metal doors was added. In the export the cars were called Suzuki LJ10 with the air-cooled 359 cc engine and Suzuki LJ20 with the water-cooled 359 cc engine (4 years earlier than in Japan the spare wheel was now mounted at the back giving the open version a total length of 319.5 cm, 2.5 cm of which were for the credit of the revised front bumper that gave the wagon a total length of 302.5 cm), by 1974 renamed Suzuki LJ50 with the 539 cc engine, and in 1977 Suzuki LJ80 with the 797 cc engine with a length of 318.5 cm. There was also a pick-up version of this vehicle with a wheelbase of 220 cm and a length of 362 cm, called Suzuki LJ51 and LJ81 respectively. In Australia the vehicle was also known as Suzuki Stockman. Still with rear engine came in November, 1970 the second generation Suzuki Fronte 71 2-door sedan with a wheelbase of 201 cm. Suspension remained the same, by May, 1971 there was also a water-cooled version of the engine. Again there were SS, SSS and SSSR versions with the 36 HP engine. 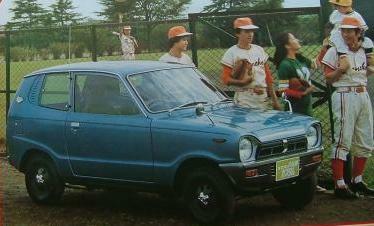 By November 1971, the cars were called Suzuki Fronte 72. Based on this vehicle came in September, 1971 the Giugiaro-designed Suzuki Fronte Coupe 2-door to be had with the water-cooled engine only. 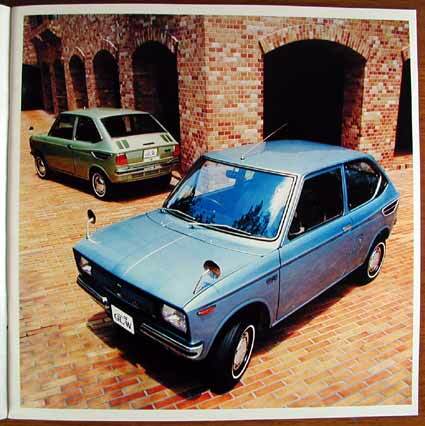 This car would be deleted in 1976 and was resurrected in revised form in October, 1977 (see Suzuki Cervo). In the export there was the Suzuki Fronte 500 with 475 cc engine, also known as Suzuki LC50. The coupe was named Suzuki LC10 in the export. In April, 1973 as a successor to the Suzuki Fronte Van came the Suzuki Fronte Hatch with the same drivetrain lay-out and engine, now with a wheelbase of 200.5 cm. The Fronte name would disappear from the vehicle by December, 1974. In the export the vehicle was known as Suzuki LS30, by 1976 Suzuki LS20 with rear side window panels. In July, 1976 the length was extended to 319 cm and the wheelbase to 210 cm with the front end after the axle being enlarged by using the grown 539 cc engine with an extra third cylinder. 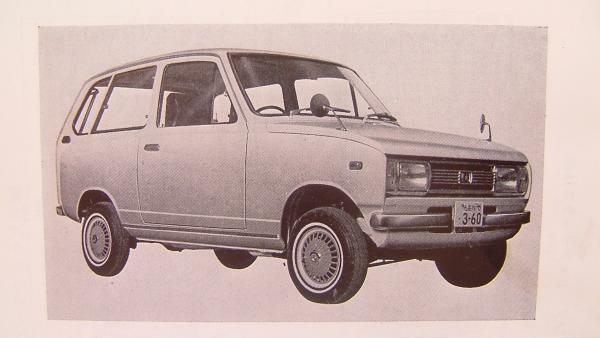 This vehicle was named Suzuki Fronte Hatch 55 and would be succeeded in 1979 by the Suzuki Alto. Less than 3 years later, in July, 1973 arrived the 3rd generation Suzuki Fronte, still with rear engine, now on a wheelbase of 203 cm. Suspension remained the same, there was now also a 4-door sedan and the cars could be had with a back window to be lifted. To comply with the revised standards for mini-segment vehicles came in June, 1976 the Suzuki Fronte 7-S on the same wheelbase, but widened to 139.5 cm, the length grew to 319 cm, the engine was new and now 443 cc (2-cycle 3-cylinder, water-cooled) and grew to 539 cc in May, 1977. In June, 1977 the car could be had with a 2-cylinder OHC 547 cc engine. 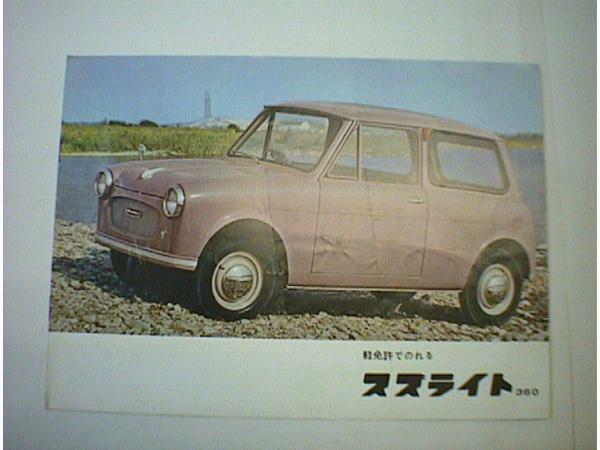 It seems by the way that Suzuki never made an OHV engined car. In the export the cars were called Suzuki LC20, Suzuki SS10 and Suzuki SS20 respectively (2-cycle engines only). 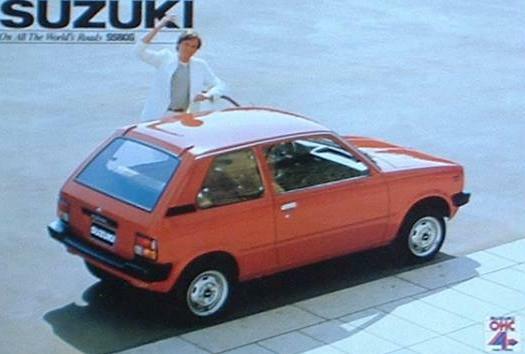 So came in October, 1977 the Suzuki Cervo (developed from the Fronte Coupe) on the same platform as the Fronte 7-S, also with a length of 319 cm. The back window was now to be lifted, the engine was the 539 cc 2-cycle. In the export this car was named Suzuki SC100 and was equipped with a 4-cylinder OHC 970 cc engine. 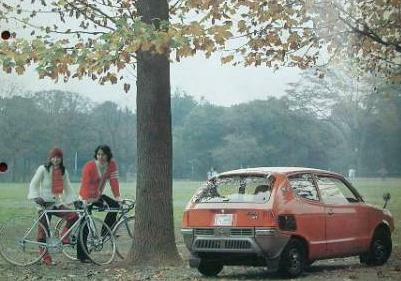 In May, 1979 the 4th generation Suzuki Fronte switched back to front-wheel-drive. There was a 4-door sedan (with back window to be lifted) and the 3-door sedan was called Suzuki Alto, which was the successor to the Suzuki Hatch. The wheelbase was 215 cm. The rear axle was rigid with leaf springs and the engines were the 3-cylinder 2-cycle 539 cc and a new 3-cylinder OHC 543 cc (the latter to be had in the Alto only by October, 1981 while the 2-cycle was deleted in the Fronte by May, 1981). In October, 1983 a four-wheel-drive Alto was added with a rigid rear axle with leaf springs and a wheelbase of 215.5 cm. In the export the cars were called Suzuki SS40 with the 543 cc engine and, with a 3-cylinder OHC 796 cc engine and a length of 329.5 cm Suzuki SS80 (Suzuki Alto in Europe). A version with blinded side rear windows was called Suzuki Hatch in Australia. Based on this generation Fronte/Alto came in June, 1982 the second generation Suzuki Cervo with a 2-door coupe body with back window to be lifted. The engine was the 3-cylinder 543 cc, in November, 1983 a turbo was added. In February, 1983 the Suzuki Mighty Boy was released with a pick-up body, no turbo available. In May, 1981 arrived the second generation Suzuki Jimny with a wheelbase of 203 cm and a length of 319.5 cm (excluding the spare wheel). Suspension and chassis characteristics remained the same. 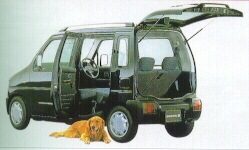 This vehicle would stay in production in Japan until 1998. The bodies again were an open one with canvas doors (to be deleted already in 1983) or metal doors and a rollover section, as well as an open version with a full metal door and frame and roll-over section, next to a 2-door wagon. The engine was the 3-cylinder 2-cycle 539 cc. By September, 1982 in Japan arrived a version with a 970 cc 4-cylinder OHC engine and a length of 335.5 cm and a width of 146.5 cm. There was also a pick-up of this version with a wheelbase of 237.5 cm, a length of 388.5 cm and a width of 142.5 cm. 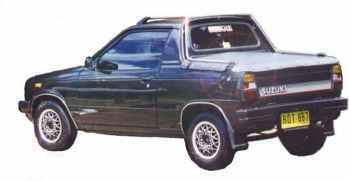 In Thailand a hardtop was developed in the early nineties to make it a doubles cab pickup, called Suzuki Sporty. A 4-cylinder 1324 cc was released by November, 1984 and in January, 1986 a turbo OHC 3-cylinder 543 cc engine was added. The 970 cc engine was deleted in 1986. During its long life, by March, 1990 together with the new standards the engine became a 657 cc turbo, the only engine available in Japan by that time. So, this time also meant the deletion of the last 2-cycle engine available in the kei car industry. In May, 1993 the Suzuki Jimny Sierra arrived in Japan with a 4-cylinder 1298 cc all aluminium engine; by November, 1995 this engine became 4-valve. Also in November, 1995 the leaf springs were replaced by coil springs front and rear, and a 3-cylinder 658 cc DOHC 4-valve turbo all aluminium engine was added. By this time both turbo engines featured 64 PS. 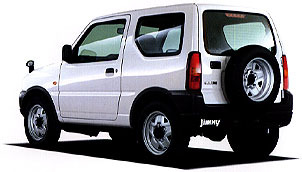 There have been interesting limited edition versions of the Jimny available in Japan during the nineties such as the Suzuki Jimny Wild Wind Limited, Suzuki Jimny Landventure and Suzuki Jimny Fishing Master next to the Suzuki Jimny Sierra ELK. In the export the 970 cc was available from the beginning as Suzuki SJ410 to be accompanied in the autumn of 1984 by the Suzuki SJ413 with the 1324 cc engine. The length of these vehicles varied from 341 to 344 cm. Both vehicles were also available as an open version (full metal doors and frame and roll-over section) with a wheelbase of 237.5 cm and a length of 401 cm. The export models were also known as Suzuki Samurai, and were built in Spain by Santana, too. In Australia the vehicle was known as Suzuki Sierra or Holden Drover, and in certain Latin American countries as Chevrolet Samurai. In India the open version is built as Maruti Gypsy with the long wheelbase and the 970 cc engine. The width is nowadays 154 cm. In 1998, the Gypsy King was added with a 4-door wagon body, the 1298 cc engine, a length of 479.5 cm and a width of 179.9 cm, the largest derivative of a K-car ever. By September, 2000 this Gypsy King is the only Gypsy left in production. In September, 1984 arrived the 5th generation Suzuki Fronte as a 5-door sedan and the second generation Suzuki Alto as a 3-door sedan with the same suspension as the previous ones but now on a wheelbase of 217.5 cm. The engine was the 3-cylinder OHC 543 cc. In September, 1985 a turbo arrived and in July, 1986 a DOHC 4-valve. Also, in July, 1986 except for the base models the rear suspension became a live axle with coil springs, also for the four-wheel-drive. Then in February, 1987 the Alto Works was released with a DOHC 4-valve turbo of 64 PS, the first in the industry reaching this limit with many others to follow. At the same time came a permanent four-wheel-drive. In the meantime, in Japan the Alto has become available as a 5-door sedan in October, 1985 and the Fronte as a 3-door sedan in February, 1987. In the export the car was named Suzuki SB 308 (Suzuki Fronte in certain Latin American countries) as a 5-door sedan only and equipped with the 3-cylinder 796 cc engine, the length was 330 cm and the width 140.5 cm. In Europe the car was again called Suzuki Alto. In India this vehicle is still built as Maruti 800 and in China as Chang'an SC 7080 or Jiangbei Alto JJ 7080 or Jiangnan JNJ 7080 Alto or Xian Alto QCJ 7080. Based on this generation Fronte/Alto came in January, 1988 the 3rd generation Suzuki Cervo with a strange-looking 3-door coupe/wagon body, the engine was a new 3-cylinder OHC 4-valve 547 cc, four-wheel-drive was available. Front fender and door panels seem to be those of the Fronte/Alto. The 6th generation Suzuki Fronte and 3rd generation Suzuki Alto were released in September, 1988 as a 3-door and a 5-door sedan. There was no Fronte 3-door sedan and the Alto 3-door sedan was also available with a right-hand sliding door. The wheelbase was now 233.5 cm, the rear suspension remained the same. The engines were now a 3-cylinder OHC 2-valve or 4-valve 547 cc, also available as DOHC 4-valve, OHC 2-valve turbo and DOHC 4-valve turbo. At the end of 1989 the Suzuki Fronte was deleted. In March, 1990 in time with the new standards the engine became a 3-cylinder 657 cc, the DOHC 4-valve non-turbo was no longer made. The length grew to 329.5 cm (new front end) and the body type with sliding door now had 2 conventional doors at the left. In November, 1991 arrived the Suzuki Alto Hustle 2-door Hi-roof window van with the 2-valve or 4-valve 657 cc OHC non-turbo engine, four-wheel-drive was available; this vehicle would be deleted in 1993. In Korea the 5-door sedan was built as Daewoo Tico (called Daewoo Fino in certain Latin American countries) with the 3-cylinder OHC 796 cc engine and with a length of 334 cm. In China, the 5-door sedan is known as Anchi 6330. This generation Alto would never be exported to Europe, the previous generation being sold till the arrival of the Cervo Mode based Alto in 1994 (and thereafter). In July, 1990 arrived the good looking Suzuki Cervo Mode as a 3-door sedan to be joined in November, 1990 by a 5-door sedan. The wheelbase was 233.5 cm, the length 329.5 cm, the width 139.5 cm, the suspension the same as the Alto. The engines were the 3-cylinder OHC 2-valve 657 cc turbo and a new 4-cylinder DOHC 4-valve turbo of 658 cc with 64 PS. Permanent four-wheel-drive was available. In November, 1990 the 3-cylinder 657 cc OHC 4-valve engine became available (without turbo). By October, 1995 the OHC 2-valve was added. 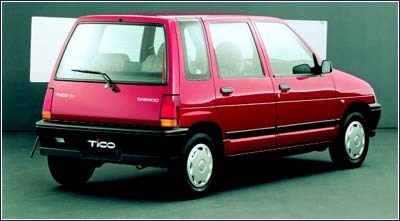 In September, 1996 the retro Cervo C became available. 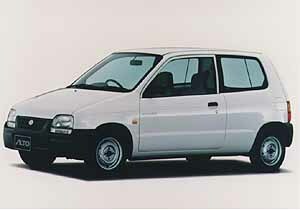 In the export and built in India by Maruti, from 1994 this vehicle became available as Suzuki Alto, widened to 149.5 cm and with a length of 349.5 cm (longer nose) on the same wheelbase, the engine was a light alloy 4-cylinder 993 cc OHC 2-valve. Initially, a light alloy 3-cylinder OHC 993 cc 2-valve was also available. This vehicle is sold in India as Maruti Zen and exported also as Maruti MH 410. In August, 1999 arrived a retro version, the Zen Classic. 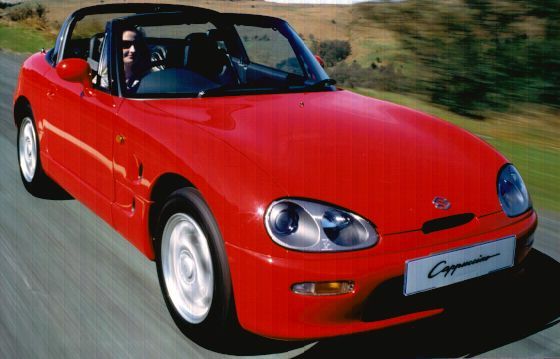 In October, 1991 came the Suzuki Cappuccino, a roadster with the engine placed in front driving the rear wheels. The wheelbase was 206 cm, the rear suspension independent, the engine initially the 3-cylinder 657 cc DOHC 4-valve turbo, replaced in May, 1995 by a light alloy 3-cylinder 658 cc DOHC 4-valve turbo. In January, 1993 the Suzuki Cara arrived, a clone of the Autozam AZ-1 by Mazda. The body was a 2-seater 2-door coupe (wing doors) and the engine the 657 cc DOHC 4-valve 64 PS turbo placed transversely before the rear axle. There was a steel skeleton monocoque frame with plastic outer panels. The suspension was independent all-round as a matter of course. The wheelbase was 233.5 cm. This car would be deleted in 1994. Then in September, 1993 came the Suzuki Wagon R, an MPV initially with 2 doors at the left and one door at the driver's side. It was based on the Alto and equipped with the 3-cylinder OHC 4-valve 657 cc engine, four-wheel-drive was available. This would become the best selling vehicle in Japan. In February, 1995 a 2-valve turbo was added. In April, 1996 came the 5-door body. In April, 1997 a light alloy 3-cylinder 658 cc DOHC 4-valve engine was released, with and without turbo. By November, 1997 a retro version was added. A Mazda clone came in November, 1994. In February, 1997 the Suzuki Wagon R Wide arrived with the same wheelbase and suspension and widened with 18 cm to 157.5 cm and with a length of 340 cm. The engine was a light alloy 4-cylinder 996 cc DOHC 4-valve with and without turbo, four-wheel-drive was available. 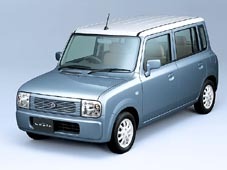 In the export this vehicle became available as Suzuki Wagon R+ with the non-turbo engine only and it had a length of 341 cm. Later an 1171 cc engine became available. In certain countries in South America, the Wagon R+ is known as Chevrolet Wagon R+. Since 2000 it is built as Changhe Suzuki Beidouxing in China. The 4th generation Suzuki Alto came in November, 1994 with the same suspension and on the same wheelbase as a 3-door and a 5-door sedan. The engines were the 3-cylinder 657 cc OHC 2-valve and 4-valve and OHC 2-valve turbo next to a new light alloy 3-cylinder 658 cc DOHC 4-valve turbo. Permanent four-wheel-drive is available. Again, this vehicle would never be exported to Europe. Then in January, 1998 came the Suzuki Jimny Wide, succeeding the Suzuki Jimny Sierra and forebode of the 3rd generation Suzuki Jimny which would arrive in October, 1998 in time with the new standards. The Suzuki Jimny Wide rides on a wheelbase of 225 cm with a length of 355 cm and a width of 160 cm (extended wheel-arches), there are rigid axles with coil springs front and rear and the chassis is separate. The engine is the all-aluminium 4-cylinder 1298 cc OHC 4-valve and the four-wheel-drive is selectable. Only body style is a 2-door wagon. So came in October, 1998 the 3rd generation Jimny with the same characteristics as the Jimny Wide with of course a length of 339.5 cm and a width of 147.5 cm. The engine is the 3-cylinder all-aluminium 658 cc DOHC 4-valve turbo. A Mazda clone came at the same time. 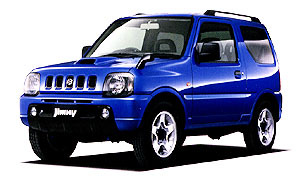 By April, 2000 the engine in the Jimny Wide became a 1328 cc DOHC 4-valve. In the export this vehicle is now called also Suzuki Jimny and is also available with rear-wheel-drive only (length 361 cm; four-wheel-drive length 362.5 cm), the width is 160 cm and the engine the all-aluminium 4-cylinder 1298 cc OHC 4-valve. A Cabrio was added in late 1999 (export only). 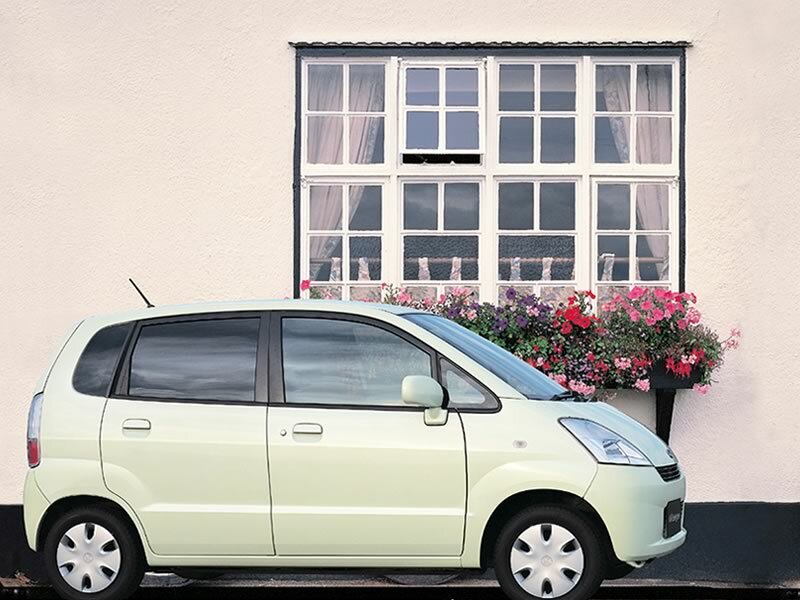 The 5th generation Suzuki Alto was released in October, 1998 as a 3-door and a 5-door sedan. Suspension remained the same and wheelbase is now 236 cm. The engines are the 3-cylinder 657 cc OHC 2-valve (still with carburettor, leaving this to be the last bonnet type kei car without injection) and 4-valve as well as OHC 2-valve turbo. New is the all aluminium 3-cylinder 658 cc DOHC 4-valve without turbo next to the one with turbo. Four-wheel-drive is available as usual. In October, 1999 arrived a retro version, the Alto C. By October, 1999 the carburettor engine was deleted, and by May, 2000 the OHC 2-valve turbo engine. A Mazda clone came in October, 1998. 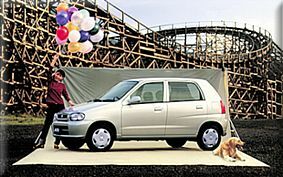 In September, 2000 the Maruti Alto (5-door only) was introduced in India, with a choice of a 3-cylinder 796 cc or a 4-cylinder 1061 cc engine with 4 valves per cylinder. The car is 10 cm longer and 2 cm wider than the Japanese version. 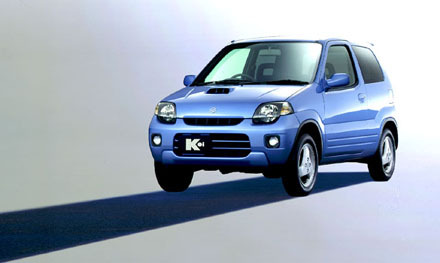 The latter one arrived in Europe by spring, 2002 as next generation Suzuki Alto. By 2000 came in Latin America the Chevrolet Alto with a 4-valve 4-cylinder 996 cc engine. New also in October, 1998 is the Suzuki Kei on the same floorpan as the Alto. The body is a 3-door sedan. The engines are the 3-cylinder 657 cc OHC 2-valve turbo next to the all aluminium 3-cylinder 658 cc DOHC 4-valve with and without turbo. Four-wheel-drive available. By March, 1999 a 5-door sedan was added and the non-turbo engine was deleted. Then, by May, 2000 the 3-door was already deleted after one and a half year. In October, 2000 the non-turbo engine was back. By November, 2001 the 657 cc turbo engine was deleted. A Mazda clone came in March, 1999. In January, 2000 came the Suzuki Swift, with the body (and wheelbase) of the Kei, as a 5-door sedan, widened to 160 cm and with the body extended at the rear and the front, total length 361.5 cm, four-wheel-drive available. The engine a 1328 cc DOHC 4-valve. By October, 2001 it was also sold in Japan as Chevrolet Cruze (altered at the front and the rear), with a 1490 cc DOHC 4-valve engine next to the 1328 cc. 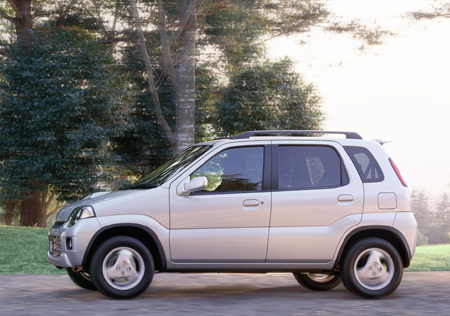 The vehicle became available in the export as Suzuki Ignis in the autumn of 2000, also as a 3-door sedan. The second generation Suzuki Wagon R arrived in October, 1998 also again on the same floorpan as the Alto, body types remained the same and the engines are the 3-cylinder 657 cc OHC 4-valve or turbo 2-valve as well as the light alloy 3-cylinder 658 cc DOHC 4-valve. A different grille and front bumper are used in the Wagon R RR with the 3-cylinder light alloy DOHC 4-valve turbo 658 cc engine with 64 PS (such a vehicle was already introduced in the previous Wagon R line in January, 1998 as a limited edition). In April, 2000 the 4-door (2+1) body was deleted after only one and a half year, together with the 3-cylinder 657 cc OHC 4-valve engine. The 657 cc turbo disappeared in January, 2002. This engine had also been used in the Wagon R RR, and the Wagon R now had the 658 cc DOHC 4-valve turbo available. A Mazda clone came in October, 1998. In May, 1999 came the Suzuki Wagon R+ with the same engines as before. The car was widened to 162 cm and has a length of 351 cm. In November, 2000 the Wagon R+ was renamed Suzuki Wagon R Solio, a 1.3 engine became available, while the 1.0 turbo was deleted. By December, 1999 arrived a retro version of the Wagon R. By January, 2001 the vehicle with 1.0 and 1.3 engine became available in Japan as Chevrolet MW. 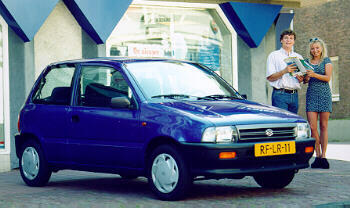 At the end of 1999 began production in India of the Maruti Wagon R with a 1061 cc engine and a width of 149.5 cm. In the export the vehicle is available with a 1298 cc OHC 4-valve engine (spring 2000) and is also built as Opel Agila and Vauxhall Agila with Opel engines (summer 2000). 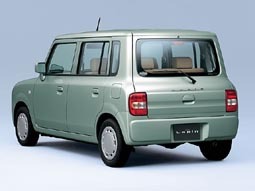 In December, 2001 arrived the Suzuki MR Wagon with the same technical data as the Wagon R (55 mm lower). A Nissan clone, called Nissan Moco arrived in April, 2002. In January, 2002 came the Suzuki Alto Lapin 5-door wagon with the same technical data as the Alto (55 mm higher), without the turbo engine. A Mazda clone came a month later.